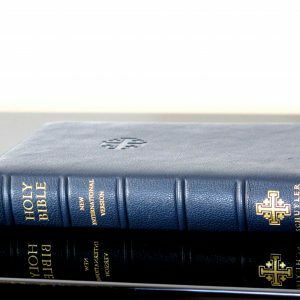 The Premier Collection of Thomas Nelson’s NKJV Single-Column Reference Bible combines fine craftsmanship with the elegant single-column text. 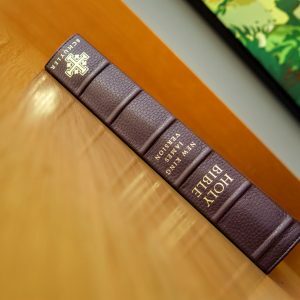 Enjoy the accurate and beautiful New King James Version typeset in Thomas Nelson’s smooth and readable NKJV Comfort Print®. 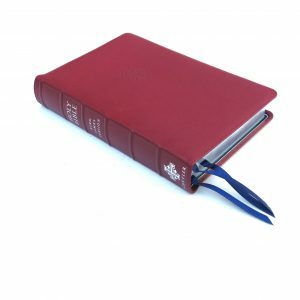 Featuring a supple goatskin leather cover, durable edge-lined binding, premium European Bible paper, beautiful art gilded edges, and three ribbon markers, this special edition is a treasure for a lifetime in God’s Word. Page size approx. : 8.125 x 5.1 x 1.6 in. 1. The size of this Bible is just right. The paper trim is 8.3 inches x 5.4 inches. With the goatskin cover, the Bible is about 9.4 by 5.7 inches. It is about 1.5 inches thick. This Bible is what you would call a hand-size Bible, not overly large like the regular Schuyler Quentel or overly small like the personal size Quentel. Even the thin line Quentel is still too tall and too wide for me. 2. 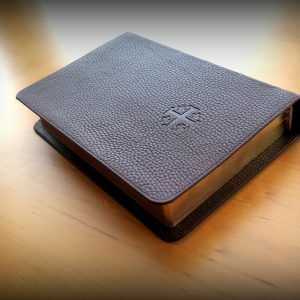 The Thomas Nelson Premier NKVJ is a single column Bible which is what I prefer. 3. Not only are the chapter numbers in red, but the section or paragraph headings (which are not part of Scripture) are in red. 4. The red art gilt is not too red (almost baby pink), so it is easier on the eyes when the Bible is open. As a result, the chapter numbers and paragraph or section headings really pop up. 5. The Bible maps omit the term “Palestine” as it should. 6. At less than $100, it beats the Schuyler Quentel. 1. The paper is a nice 36gsm Bible paper. However, this Bible is printed in China. 2. Same line matching technique is used which prevents ghosting. 3. It has gilt line stamping and perimeter stitching. 4. 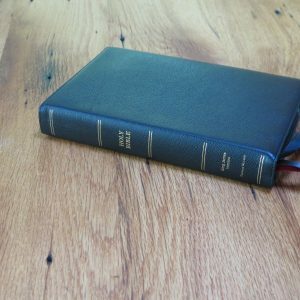 This Bible has a supple, less grainy goatskin cover than the Quentel, but it is also edge-lined as the Quentel. 5. Like the Quentel, this Bible is smythe-sewn. I am very pleased with this Bible, and I am glad Thomas Nelson came out with this in the NKJV. The size is my ideal size in a Bible. This Bible comes with three ribbons which I removed because inserting anything in the pages of the Bible is bad for its spine. It’s supposed to be a 10.5 font size, but I believe it is smaller than that. The font is probably a 9 or a 9.5. It is still very readable, however. Great bible! Early Christmas gift from wife and kids! Meets all my needs and expectations. 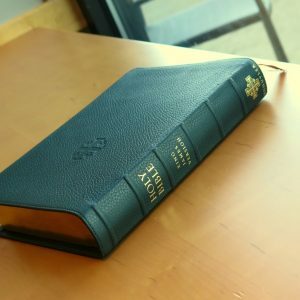 Great bible at a great price! I’ll try not to repeat what has already been stated about this Bible, but in short this is what I had hoped the Schuyler NKJV Quentel would have been, especially concerning text block. The layout is almost perfect, as is the overall size, paper, and text font (the Denmark 2K Nelson font is excellent). The combination of dimensions, layout, text size make this both a joy to read and handle privately but also a wonderful tool to wield while preaching and teaching. Having owned the Schuyler Quentel NKJV, the Original Schuyler Single Column, and the Cambridge Clarion, I’ve had 3 of the best NKJV editions to compare with and this Thomas Nelson is my current favorite. The Schuyler Single Column had a great font and I enjoyed the Single Column but the line ghosting and lack of references was more an issue than I thought it would be (Silver over blue gilt I’ve always found accent the beauty and majesty of God’s Word). 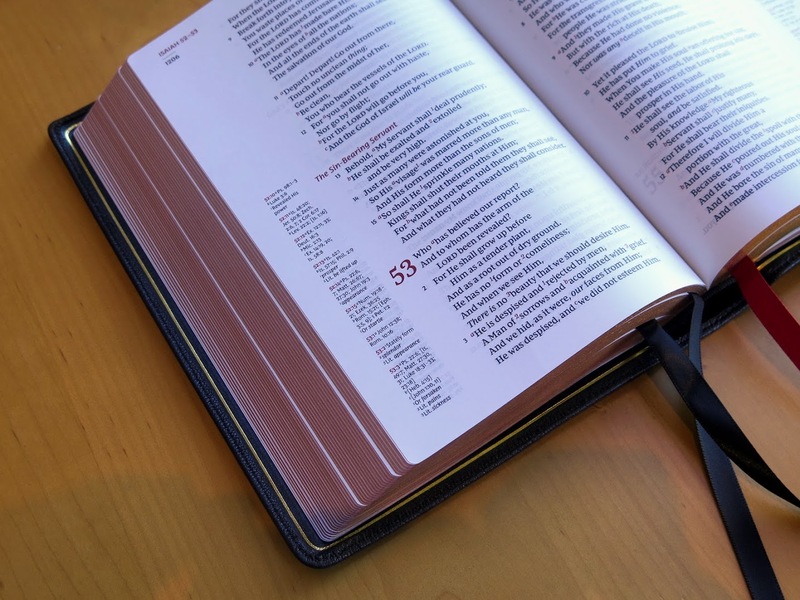 The Cambridge Clarion is perfect… for everything but Preaching! If Cambridge would come out with a 10.5 font version, it would be all I would use. Outstanding reference section, my favorite text block (especially the minimizing of section headers). I have found the Clarion to “get out of the way” and let me read God’s Word more than any other Bible I’ve utilized. The placement of their references and NJKV translation notes to the side directly next to the referenced verses is also extremely well thought through. The Shuyler Quentel is one of the most beautifully crafted Bibles I’ve ever held, almost too much, lol! The font and font size are outstanding, but for me almost a tad too large. The cascading center aligned reference section at the bottom of the page makes it almost impossible for me to quickly use it and I found that I stopped trying. Though beautiful to the eye, it was not nearly as functional as my Clarion, and though I used it to Preach and Teach from, still found it cumbersome in both dimensional size and readability with it’s double column layout. The Nelson Comfort has the perfect balance of dimensions, Not much larger than the Clarion, smaller than the Quentel, but not so thick that you can’t hold it in one hand (I have medium sized hands to my Guitar’s chagrin!). 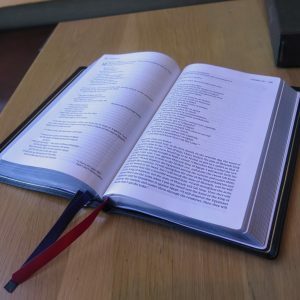 The references are easy to visually access on the outside margins, vertically arranged with the corresponding letter “a”, “b” etc., highlighted in the scriptural text itself. I would have also like to see the scripture verse numbers to have been in bold or a different font to make them easier to find. 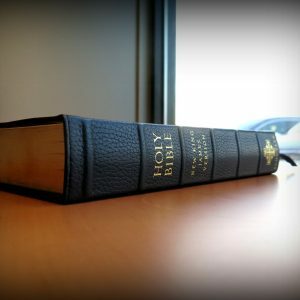 As to value, this was much less expensive than the Quentel (or Clarion) but this comes at the cost of having it printed in one of the country’s responsible for some of the severest persecution against any of their citizens that choose to follow what this Bible instructs… still wrestling with that one. I also could have purchased this for $15 less on Amazon, but enjoy supporting Evangelical Bible and it’s founder’s ministering. As to aesthetics, the Nelson goatskin is much softer with a smoother grain than the Quentel. I personally enjoyed the feel of the Quentel more (I’m a guy :). 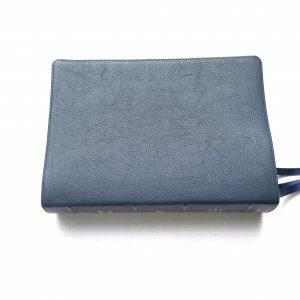 I had my Clarion rebound by Leonards Books in English Calfskin (bought the cheaper Calf-Split purposefully), and have found that to have been a robust solution as well. I also miss the ribs on the spine which my Schuyler Quentel had.. actually the spine in general had a greater firmness to it in general on the Quentel. The spine on the Nelson is smooth and feels a tad too open, but not an aspect which discourages my use of it. The only other “improvement” I’d like to see with this edition would be a dark navy blue, with silver over blue gilt edges, and perhaps a more robust map, reference section, and a 2-year through-the-bible example. We are so truly blessed in this nation to have such choices. 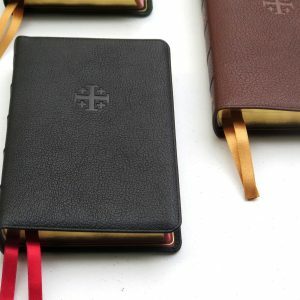 I always struggle with writing any reviews about Bibles knowing full well how many world-wide are persecuted for even owning one, and how many would sacrifice so much for any copy regardless of craftsmanship. Let us all continue to lift them up before God’s throne! 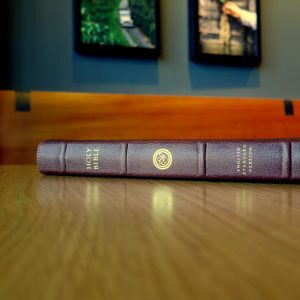 The Lord gave me a desire to own a few excellent copies of His Word… basically in short, if I was willing to spent $300 on a grill why wasn’t I willing to sacrifice the same for an heirloom class of God’s gift to us in writ? Thanks EB for the great packaging and quick shipment. Keep the Lord and His Work your focus! I concur with all the praise of this bible. 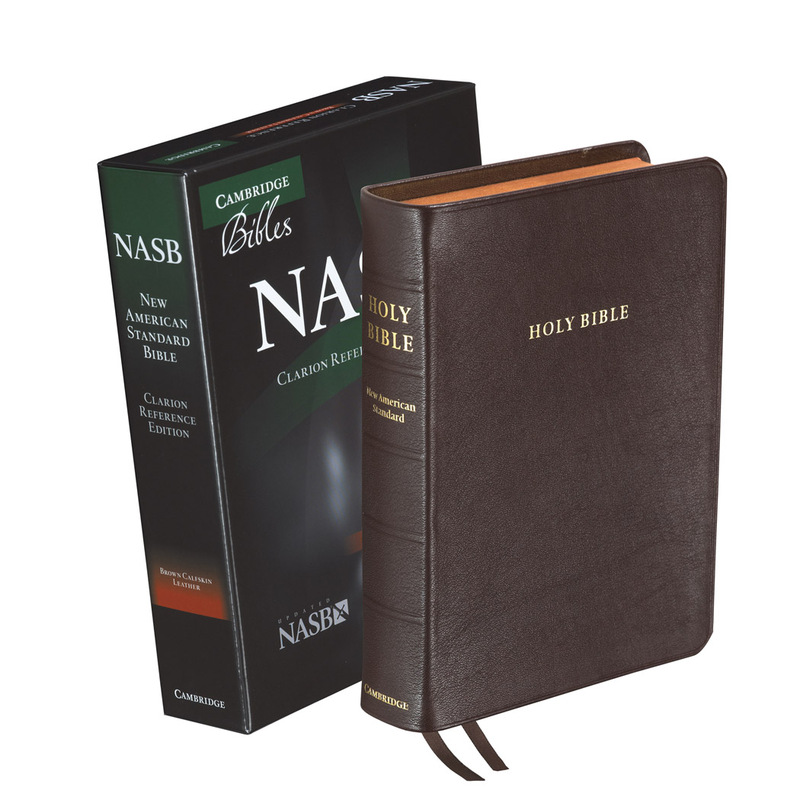 It is comparable to the other super premium bibles here. The translation note and cross reference superscripts are also in red which is helpful. As someone else has said, the verse numbers could be more prominent. At 2.5 pounds I was afraid it would be something of a brick but after an hour I was completely accustomed to it and prefer its size. It is portable and rocking chair ready.